The students of SPA 320 (Spanish American Culture), OLAS (Orgullo Latino Association), MOSAIC, CROSSROADS and Zeta Chi Pi invite you to take part in “Ofrenda: Day of the Dead Celebratory Ceremony.” The celebration begins with a candle lit processional from the Campus Center at 7:00 p.m. to Christ Chapel. 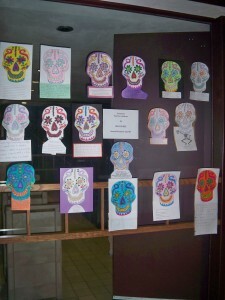 The chapel will be decorated with student altars, sugar skulls and Calavera poetry. The ceremony will include a reflection on “la ofrenda / offerings” by Chaplain Rachel Larson, traditional Mexican music performed by Spanish professor Ana Adams and Music professor Jim McGuire, poetry readings, a discussion of the similarities between Halloween and the Day of the Dead and student petitions. After the ceremony, friends are invited to view student altars, enjoy live music and a reception of Mexican homemade bread consumed on this day. Sponsored by Latin American, Latino and Caribbean Studies (LALACS), Modern Languages, Literatures and Cultures (MLLC), OLAS, MOSAIC, Crossroads and Zeta Chi Pi.